Since the 1980’s, employee satisfaction has been considered the driving metric in employee performance and, ultimately, business performance. The ROI has always thought to be that happy employees lead to a more productive workforce. However if this ‘productivity’ isn’t adding value to the bottom line, what does it matter? 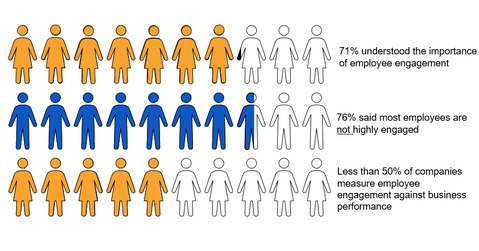 Research from MITsloan in 2015 identified that employee satisfaction represents only 25% of what actually contributes to business performance – and the focus needs to be on engagement and alignment. Businesses that focus solely on satisfaction are missing 75% of the puzzle – and missing the bottom line value which comes from engaged and aligned activity. HR Coach’s ongoing research in the Australian market since 2005, shows that there is a direct link between engaged employees aligned to the strategic goal of the business and business success. Businesses without strategic alignment are busy being busy, like gerbils on a wheel, and the only thing stopping them from exiting the market is the activity of their employees. They aren’t growing, they are just holding on. Focusing solely on satisfaction is the same as the finance team focusing solely on reducing expenses and not worrying about revenue and cashflow while still expecting the business to improve. Take a wholistic (engagement and alignment) approach to your business, and you will find that the wage payments you make every fortnight can actually drive exponential growth to your bottom line. 28% reduction in shrinkage or theft. If you want to stay or become a high performing business, you need to measure the right things. Employee satisfaction counts, but it is not enough. Engagement and alignment are core.